today on your smartphone or tablet. Brought to you by the Nursing Home Abuse Lawyers Brown Chiari. 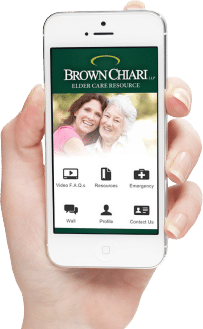 The app shares useful information regarding nursing homes and patient rights and delivers it right to your smartphone. As New York State’s largest nursing home abuse law firm, we have dedicated ourselves to improving the lives of the elderly in Western New York. This app is designed to assist their caregivers and family. We are proud to be able to share our knowledge with the community. The app is designed to make information about nursing home care and rights more accessible. It contains videos, frequently asked questions, and resources for New York State residents. The nursing home abuse lawyers at Brown Chiari LLP handle more nursing home negligence cases than any other law firm in New York State and have obtained the highest verdict in upstate New York on behalf of an injured nursing home resident ($1,500,000.00 in New York State Supreme Court on July 21, 2004). The New York community has come to rely on Brown Chiari LLP as the premier nursing home neglect law firm. Contact us today for a Free Evaluation. Click the store below to get it now.